This little red bean is high in protein, and its naturally sweet flavor has led to its use in many of Japan’s much-loved desserts, such as the bean paste that fills rice cakes and anpan (bea- filled buns). It is also cooked with mochi gome glutinous rice and sprinkled with salt and goma (sesame seeds) for sekihan, a special dish that is served on special occasions such as birthdays and festivals. 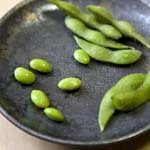 The soybean grew in popularity in the 7th century, when Buddhism entered Japan. High in protein, fat, and rich in calcium, vitamins and minerals, daizu is known as the “beef of the field.” The US is the largest producer, and Japan imports 5 million tons from around the world. Soybeans are used to make soybean oil, tofu, soymilk, miso, soy sauce, and a host of other things. Roasted and finely ground soybeans make kinako, a powdered coating for Japanese sweets. They can also be enjoyed boiled with seasonings and other vegetables. 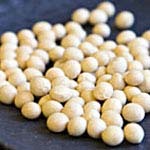 Dried soybeans can be found in health food stores, and can be stored almost indefinitely in a cool, dark and dry place. Different varieties have different flavors – it’s best to ask for mild and bland varieties when making soymilk and tofu. I usually mail order my beans in bulk from a farm in Minneapolis. One 20-pound shipment lasts the whole year. 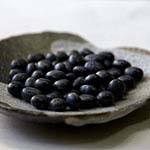 The glossy black, long simmered sweet kuromame is one of the main auspicious dishes for the Oshogatsu New Year’s celebration, symbolizing fertility. They are simmered in sweet syrup, along with kombu. I’ve tried making the dish for the past two years, but no matter what I do, I can’t seem to replicate the meltingly soft texture of the store-bought beans. If someone has a secret, please let me know. This is known as one of the tests for non-Japanese who like Japanese food. 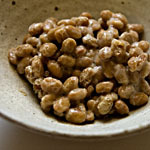 My husband is always asked “You love Japanese food, but do you like natto?” Luckily, he loves this nutritious and inexpensive delicacy, and always elicits an amazed reaction when he gives his answer. But other Westerners — and many Japanese — find it far less appealing. 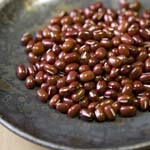 The beans are allowed to ferment with a starter bacteria for over a day, which causes a sticky, slimy substance to form. This has an earthy, pungent aroma that some people liken to rotting cheese. It is usually eaten over rice for breakfast, flavored with soy sauce, a dab of hot mustard and chopped green onions or shiso. My nieces and nephew love my mom’s special natto maki with ground white sesame seeds. I hardly have to explain what tofu is. Luckily, this miracle food is now consumed worldwide. But fresh tofu made in Japan is especially delicious. Although tofu is said to have very little flavor, I can certainly notice the difference between supermarket tofu in the U.S. and freshly made tofu from a specialty maker such as Morinaga in Kyoto. It is said that the better the water, the more delicious the tofu. You can also try making tofu yourself if the water in your area is clean and pure. The health benefits of tofu are well known. It is high in vegetable protein, vitamins B1 and C, calcium, zinc and potassium. Tofu also contains essential amino acids. and is easy to digest, slows the aging process, and strengthens bones and teeth. 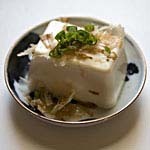 Tofu has very little flavor of its own, and takes on the flavors of dipping and simmering sauces. It comes in many forms and is extremely versatile. Needless to say, tofu is best eaten fresh. Try to use it within a few days of purchase. It doesn’t freeze well, because the water trapped in the tofu turns into ice, forming air bubbles. 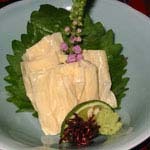 Kinu-goshi, or silken tofu, is the most nutritious. It is strained with silk and has a fine, soft, silken texture. It is best eaten raw with soy sauce and a dab of wasabi, or with a sprinkling of kastuo bushi and green onions. In winter, it is often enjoyed hot, as yudofu, where it is gently warmed in hot water and dipped in a delicious ponzu sauce. Age-dofu differs greatly in flavor and texture from fresh tofu. It has a chewy texture, which is appreciated in vegetarian cuisine. It can be found in plastic bags in the refrigerated section of Asian markets. I cut it into slices and add it to miso soup, or simmer the squares in flavored soy sauce for inari zushi. Age-dofu is often stuffed with vegetables in vegetarian temple cuisine. To get rid of excess oil, pour boiling water over the tofu. 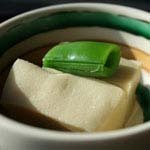 Koya-dofu was developed by monks who discovered that by freeze-drying tofu, it could be kept forever. Sold in plastic bags at Japanese markets, the beige, dry rectangular blocks are reconstituted in water and simmered in flavored broth. The texture is spongy and quite different from regular tofu. If you venture to Koyasan, a monastic retreat south of Osaka (for which Koya-dofu is named), I recommend that you stay for one night at a shukubo (pilgrim's retreat) connected to one of Koyasan's many temples. There, monks serve koya-dofu in many different ways. Okara is the pulp that is leftover when making soy milk and tofu, and literally means “honorable husk”. It contains valuable fiber, nutrients and minerals such as iron, but unfortunately, is often discarded. Fresh okara doesn’t keep for very long, and difficult to find for sale in the West. More likely, you will come across dried okara, which is a popular health food staple for baking. However, if you have a soy milk maker and make soy milk or tofu regularly, you will find you have more than enough of this beige, crumbly pulp. Having almost no taste of its own, it soaks up the flavor of whatever condiments and sauces are used. I know this description doesn’t sound appetizing, but okara is a wonderful and versatile ingredient, and very delicious. 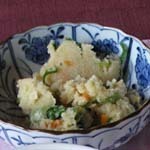 Its crumbly and substantial texture is the yang to tofu’s creamy yin.